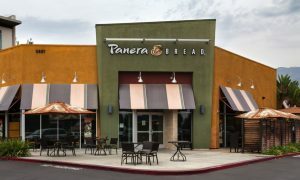 Panera Bread Co. (NASDAQ:PNRA) has announced plans to expand delivery services to more of its cafes and hire 10,000 new employees by the end of the year. It hopes to expand delivery to 35 percent to 40 percent of locations by the end of 2017. According to Panera’s forecasts, delivery will add roughly $250,000 per year to each store’s annual revenue of $2.6 million. Adding delivery capabilities will cost roughly $25,000 per café, with most of the cost being spent on hiring and training labor. After the initial financial investment, most cafes are able to garner about $5,000 a week with delivery making up about 10 percent of sales. Hurst added that about 80 percent those new sales are from new customers or existing customers increasing the frequency of their purchases. Panera said delivery will generally be available between the hours of 11 a.m. and 8 p.m. seven days a week. According to the company, the minimum menu purchase for delivery is $5 and the typical delivery fee will be $3. The company’s new order tracking system lets customers to see the expected arrival time and a map of the driver’s progress, as well as a photograph of their driver. Delivery is also linked to its MyPanera loyalty program, which has about 25 million members. The planned new hires will assist with the company’s delivery initiative. Each cafe is expected to hire seven to 12 drivers and staff members, according to a statement from Blaine Hurst, president of Panera. Hurst said that the company is using internal team members so that it could offer a reliable and accurate service to customers, allowing Panera to have more control over the guest experience. About 75 percent of the new hires will be delivery drivers and the remaining 25 percent will be employed for in-cafe jobs. Drivers will drive their own cars and will be compensated for their mileage. Taking an Uber-style to delivery allows Panera to avoid investing in its own fleet of vehicles. In order for the drivers to be hired by and certified to work for Panera, their insurance, driving records and car will all be inspected initially and on an on-going basis. Ron Shaich, Panera founder, chairman and CEO, said, “We’re closing the gap in delivery alternatives and creating a way for people to have more options for real food delivered to their homes and workplaces.” The company introduced delivery in early 2015 and has already rolled out delivery to 15 percent of its locations. At the end of 2016, Panera had 2,036 owned and franchised restaurants. Panera is currently in the process of being acquired by JAB Holding in a deal valued at about $7.5 billion. JAB controls the Krispy Kreme chain and coffee brands Keurig, Peet’s and Caribou.